Let’s talk about spice, baby. Let’s talk about you and me. Let’s talk about all the sweet and spicy things that make these pork chops…that includes a little S & P. Was that too chessy?!? Maybe…but these pork chops surely are not. The recipe (courtesy of Food & Wine) calls for pure ancho chile powder. Well, I did not have ancho chiles, but I still have a TON of cayenne peppers from a few years back when I tried making my own chile spiked vodka as a Bloody Mary base for X-mas gifts one year…let’s just say the vodka is killer…and I mean that literally and not in a “dude” way. N-E-ways. 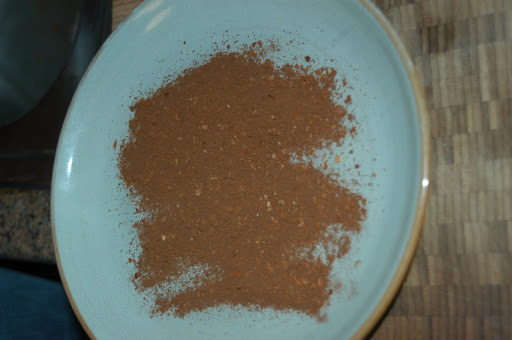 I grounded up some cayenne pepps, combined some cocoa powder and brown suga’ and wall-la! Friggin’ amazing! These were spicy, like really spicy. If you don’t like spice I recommend a basic mexican chile powder or as the recipe suggests ancho chile powder. Here in Denver, you can find whatever chile your heart desires – fresh or dried – in the regular supermarket. But in case you aren’t sure what the h-e-double hockeysticks an ancho chile is, it’s actually just a dried poblano pepper. Poblano are the long, wide dark green chiles. Ancho is the dried version and like a poblano they are much milder than a cayenne. Oh, oh, oh…one of my fave side dishes! 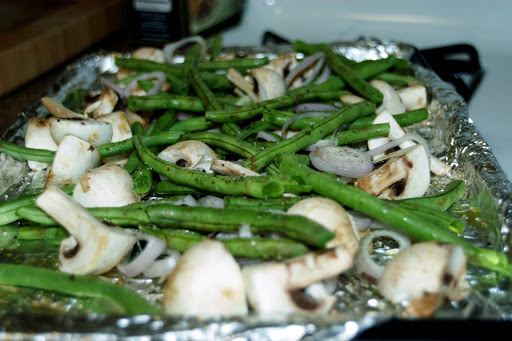 Roasted green beans and mushrooms with garlic, shallot amazing-ness! Add some EVOO and S & P and pop in the oven for 12 minutes and literally one of the best side dishes…at least on the Callahan scorecard. Lastly, I must tell you that grits for dinner is perfectly acceptable. This is coming from the household that goes through a canister of grits in about 1 week (does that qualify as an obsession?!?). I will share my most perfect grits recipe, but later. Time for the spicy sweet pork chops that look oh-so-delish. In a large bowl or your regular marinating dish, combine water, red pepper, and 1 1/2 tspn. of salt and stir until salt dissolves. Add pork chops and let brine at room temp. for at least an hour. Light a grill (create an indirect heating scenario: if you have a charcoal grill, move all coals to one side or for a gas grill, just light one side). In a bowl, mix cocoa, sugar, and chile powder, with 1 TB salt. Drain pork chops and pat dry. Brush or drizzle with EVOO. 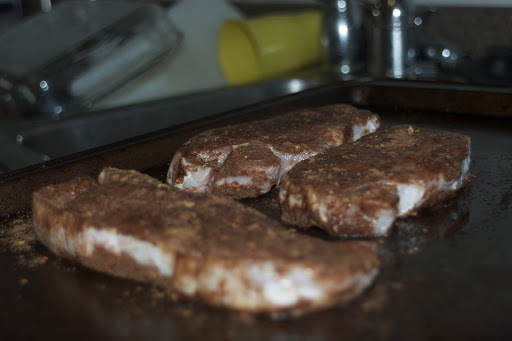 Press pork chops into cocoa rub and press to help adhere. Repeat on both sides and with each pork chop. Grill over moderate-high heat for 4 minutes, turning once, until lightly browned on each side. 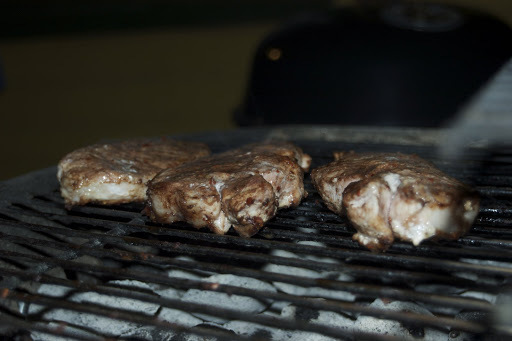 Move chops to cool side of grill and cover and let sit for 10 – 15 minutes. Thermometer should read 135 for medium meat. Let chops rest before digging in. 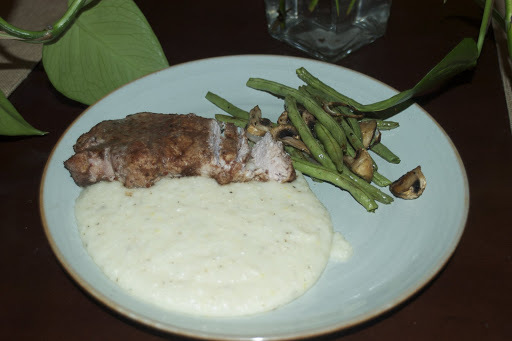 Serve with veggies, grits, and water to cool down the heat! This entry was posted in grill, pork by callywoodfarms. Bookmark the permalink.